Infantino at 1. Are the Ethics bigwigs the next stop on his personal ‘reform’ agenda? February 27 – Plus ca change, plus c’est la meme chose. The more things change, the more they stay the same. Some might suggest that in Gianni Infantino’s case they have actually got worse. On Sunday, Infantino who, let’s not forget, was a stop-gap candidate who seized his chance, celebrated his first year in charge of FIFA. As he did so, he issued a tub-thumping open letter on FIFA’s website, accompanied by a detailed, colour-coded information kit, outlining everything he had achieved in his first 12 months in terms of improving FIFA’s governance structure. Addressed to “everyone who cares about football”, Infantino conceded that mistakes had been made but, tellingly, did not admit that any of them were his. The letter went on to justify the expansion of the World Cup and the FIFA Legends project, two of the more controversial innovations of his leadership, the former splitting global opinion, the latter viewed by many as nothing more than an exercise in vanity. 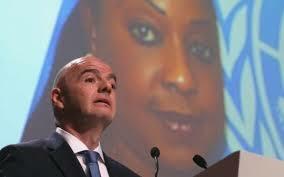 The fact that Infantino opted to mark his one-year anniversary by issuing such a defiant reminder of his accomplishments – summed up in ‘FIFA 2.0’, his master governance plan released last October and packaged to portray him as a man who means business – the move is being construed by his critics as a desperate attempt to reach out to those who increasingly question whether he really is the right man for the job. Actions speak louder than words. No amount of self-promotion can escape the fact that Infantino, for all his promises about increased funding and greater transparency, is unable to shake off the perception (in some quarters at least) that he is more interested in keeping his enemies at bay than by launching headlong into the reform process which, just for the record, was being drawn up well before he started taking credit for it. Infantino may like to think he has heralded a bright new dawn but the first year of his presidency tells a different story. Key sponsors are still missing while one fifth FIFA’s staff in Zurich have left the organisation since he took over, not all of them apparently simply down to what FIFA euphemistically describes as “internal restructuring”. If rumours are to be believed, an atmosphere of fear and intimidation prevails. Insiders talk of anxiety and uncertainty, even among long-term employees. A wolf in sheep’s clothing is how one employee described Infantino. No one, it seems, knows where the red pen of his trusted sidekick Fatma Samoura will strike next. Throw in the fact that the hard hand of American justice still looms large in the background and an entirely different picture emerges to the one Infantino would have us believe. And it could be about to get a whole lot worse, with growing indications that Infantino wants to get rid of FIFA’s top ethics judge whose decisions have brought down a raft of corrupt FIFA bigwigs. Last year at the FIFA Congress in Mexico City, Infantino smuggled through a new law which gave his ruling council carte blanche to hire and fire members of the judiciary bodies, wiping away their independence in one fell swoop. As Infantino’s critics cried foul, audit and compliance chief Domenico Scala resigned in protest – just before he would almost certainly have been pushed. But the two figures responsible for investigating and punishing the miscreants, ethics chief investigator Cornel Borbely and German judge Hans-Joachim Eckert, decided to tough it out. A few months later, Infantino himself was cleared of any wrongdoing by Borbely’s investigations team though Borbely himself, being of the same nationality as Infantino, had to stay out of the case. Whilst there is no proof, many believe that the decision to exonerate Infantino was directly related to the Mexico ruling; in other words that those who looked into the evidence against him acted as they did for fear of possibly losing their jobs. It is widely rumoured too that Borbely, despite being out of the picture, was uncomfortable with the outcome of the case though this cannot be verified. The whispers now, worryingly, are that Infantino is plotting behind the scenes to gain sufficient support to replace Eckert and maybe Borbely too at FIFA’s Bahrain Congress in May even though more than 60 cases of ethics violations have been prosecuted over the last four years in an attempt to clean up the organisation, notably those of Sepp Blatter and Michel Platini. The narrative being disseminated is one of Infantino bringing in ethics chiefs who are more sympathetic to his agenda. Indeed, FIFA watchers are even suggesting that the one-year “hire and fire” rule that led to Scala’s downfall may be extended. If that happens, the message it would send out would be nothing short of a public relations disaster for FIFA just at the time when its expensively hired internal lawyers are trying to maintain its victim status in the various ongoing corruption investigations. For his part, it is understood that Eckert has made it clear he would like to carry on for another term even though, scandalously, he was not told of the infamous Mexico mandate before it was suddenly tabled. Eckert may have been criticised for failing to allow full disclosure of the notorious Garcia report into the 2018 and 2022 World Cup bid process but he cannot be accused of lacking conviction in terms of those whose careers he has effectively ended. Sources familiar with the workings of his office insist he has never once been influenced by outside forces in his decision making, not even after the infamous Mexico decision. Whether or not that is true, it may not be enough to save him. Eckert has inevitably made enemies; it kind of goes with the territory. But over the next few weeks, amid fears that his mandate will not be renewed, alternative names seem likely to emerge. Whoever is installed could have a direct effect on FIFA’s image and reputation as well as the credibility of the entire ethics process. Infantino may have triumphantly proclaimed a year ago that the crisis in FIFA was over but a number of skeletons remain in FIFA’s cupboard that could potentially heap further embarrassment on the organisation and its leader. Which makes it all the more essential, given the priority Infantino says he is giving to governance, for FIFA to retain a robust ethics body worthy of the name.